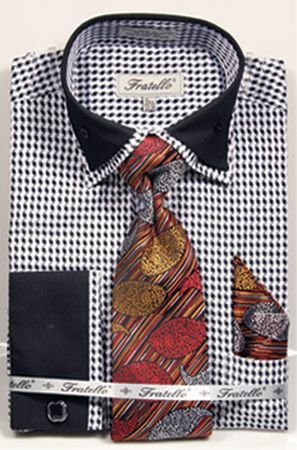 Get your dress shirt tie and hankie collection renews are start collection them from Fratello shirts. These Italian designed dress shirt and tie sets have the style that will make your suits come alive with flavor and attitude. This black hounds tooth pattern dress shirt features a button style collar and french cuffs. The tie and hankie is a stylish bonus. Made of cotton/poly fabric.